The Fort Worth Mountain Bikers' Association (FWMBA) will be having a Workfest to begin construction on a new 5.5 mile extension to the Gateway Park Mountain Bike Trail. The Workfest will be Saturday, November 5, 2011 starting at 9 AM. Please note, this is not an extension of the paved Trinity Trails, this is a off-road, dirt trail for mountain bikes. There is an existing 4 mile mountian bike trail in Gateway Park (also created by the FWMBA) and this new 5.5 mile trail [pdf map] will be on the other (East) side of the Trinity River, it will "traverse many of the hills adjacent to Interstate 30 and provide the mountain bike community of north Texas some amazing views of downtown Fort Worth". The FWMBA "is calling out to the mountain bike community to join us to help make this new vision of Gateway Park a reality." Visit the FWMBA website for more details. Burger Stand on the Trinity Trails!?!? UPDATE: It is called The Woodshed and it is a Tim Love restaurant (Lonsome Dove, Love Shack, etc.) Read more about it on Fortworthology. The Phyllis Tilley Memorial Bridge is under construction south of the Lancaster Avenue bridge. 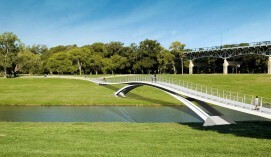 The pedestrian and bike bridge will offer a new connection between the Trinity Trails and downtown Fort Worth. The bridge will span 384 feet and is, according to the bridge's architects, the first stress ribbon-style bridge of its kind in the US. It is a $3 million project and should be completed by the end of November. More architectural renderings are available on the project's architects' site: Freese and Nichols. Streams and Valleys, which contributed $250,000, to the cost of the bridge also has more information on their site. NBC Channel 5 had a report on the bridge yesterday that you can view below. The text of their story is available on their site. Joggers and bikers will still have access to the Trinity Trails in that section of the Clear Fork, but signs will be posted warning them that equipment may be crossing the trails. The $1.5 million project will begin near Southwest Boulevard and move downstream towards Trinity Park.